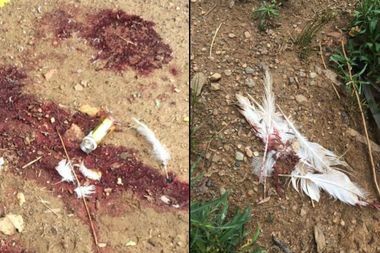 Wildlife advocate Mary Beth Artz came upon this scene of fresh blood, broken glass and feathers in Prospect Park on July 8, she told DNAinfo New York. PROSPECT PARK — A swan is missing from Prospect Park, parks officials said, and a wildlife group fears it is dead after an advocate found fresh blood, broken glass and long white feathers near a homeless encampment, she said. Mary Beth Artz of the group W.I.L.D. for Prospect Park came upon the gruesome scene on the morning of July 8 near the park's Vanderbilt Street entrance, she told DNAinfo New York. She spotted a puddle of blood, fathers and glass amid rubbish in a thicket of bushes. Two men sitting near the encampment told her “a raccoon took it,” the wildlife advocate said, but she immediately thought it was bogus, particularly after they tried to hide the scene when she walked away for a moment. “I came back and the guys had covered up all of the evidence. They had covered up the blood with cardboard, brown paper, anything that they could find. The broken glass had been picked up. The feathers had been removed,” she said. At the time, she and other park-goers in the W.I.L.D. group counted the adult swans in the park and found that one was missing. On Wednesday, the Parks Department confirmed that there are now seven swans in the park, when there previously had been eight. However, the agency is not convinced the swan is dead. For one, no other remains have been found, and the department pointed out swans are territorial animals and can sometimes get into bloody battles, particularly when young swans reach maturity. Parks Department spokesman Crystal Howard said the agency is aware of the incident and is investigating. “We have not found a carcass, but we are continuing to monitor the area closely,” she said in an email. “The amount of blood, the broken glass — all indications, as far as I’m concerned, and as far as a lot of other people are saying, is that this was human-caused. This was not swan-on-swan aggression and I’m sticking to that,” she said. W.I.L.D. made Parks Enforcement and the NYPD aware of the situation and urged anyone who sees wildlife being harmed in the park to call 911 right away. The story of the missing swan was first reported by AM New York. The fate of the swan is the latest in a string of strange behavior involving wildlife in the park. In July, a possibly rabid squirrel attacked multiple New Yorkers in the park; its whereabouts are unknown, but city officials assume it is likely dead by now. Earlier this spring, poachers were caught red-handed by Parks Enforcement trying to steal turtles from the park’s lake, according to Bklyner.